Experience the Great Outdoors in Big Bear California at Action Tours Big Bear. Winter is here and staying indoors doesn’t have to be an option anymore! Enjoy the beauty of the winter solitude amongst the Jeffrey and Ponderosa pine trees surrounded by snow capped Big Bear Mountains. Their multi-terrain tours are customized to each group so you can choose to go easy, go hard or any combination during your three hours. The beauty of Snowshoeing is that there are many trails you can enjoy that are not accessible via snowboarding or skiing. Book your tour today here. 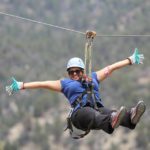 Action Zipline Tours are the most exciting way to experience Big Bear year-round, weather permitting. The three hour tour includes an off-road ride two miles into the forest in safari jeeps. They boast nine high-speed zipline lines that run down the mountain for the most avid thrill-seekers. There is a beautiful suspension bridge with stunning views of Johnson Valley as a backdrop for it all. Action Zipline Tours is truly an adventure! Book it today here. Action Tree Rope Climbing is a fun, new and exciting adventure! Southern California’s one and only Action Rope Tree Climbing is in beautiful Big Bear California! An exhilarating and fun activity for the whole family (anyone) 12 years and older can experience! Get climbing today here.